Eichendorff’s poem Mondnacht, often translated as “Night of the Moon” unquestionably ranks among his best. It is said to be one of THE favourite poems of the Germans. That I can easily believe, for even the oh so “modern” citizens of the 21. century can hardly remain untouched by the magic of these three verses. And the reason is not only Eichendorff’s positively shattering command of language, his characteristically desirous tone and the subtle intertwining of nature and personal inner reflections. Eichendorff’s strongest poems point further towards greatness, towards metaphysics, and yes, religion. This is clearly the case with Mondnacht, and the key word is “meine Seele” [my soul] (first line of verse 3). The image of death is tenderly and touchingly portrayed as the soul quietly returning home, and we experience death in this context as a liberation from earthly weight and bitterness (thus, in an excellent essay, Wolfgang Frühwald, Professor of German literature). And one should also not overlook the simple fact that Mondnacht belongs to the “Spiritual Poems” within Eichendorff’s collection. In her preface to the Henle Urtext edition of Schumann’s “Liederkreis” op. 39, in which Mondnacht is the 5th in a cycle of 12 songs, the editor points out that “the religious overtones of the text of Mondnacht were apparently still recognised, for this song was performed on 22 September 1856 at the musical commemoration ceremony for Robert Schumann in Dresden” (Kazuko Ozawa). Click here to read the preface and other information on the newly published Henle Urtext edition. Interestingly, Schumann created four different versions of Mondnacht; you will find them all, together in print for the very first time, in the new Henle edition. Theodor W. Adorno rightly making reference to Goethe’s dictum remarked that “it is very difficult to speak about Mondnacht, as is the case with all things created to great effect.” And yet, I would like to attempt an approach to the singularity of this especial song. For Clara Schumann, to whom the entire Liederkreis cycle is closely connected, Mondnacht in any case had great importance. From Berlin she wrote to her fiancé, who lived away in Leipzig: “It is deeply melancholy, and so sad that I cannot sing it at all without it bringing sorrow to me” (15. May, 1840). And there is a hidden, and I assume till now undiscovered beautiful musical allusion from Robert to his bride: the melody of Mondnacht literally cites the beginning of the most famous Beethoven song with the significant title “An die ferne Geliebte” (op. 98) [To the distant beloved]. Schumann was familiar with this Beethoven song, a fact that real Schumann enthusiasts can easily trace to his Fantasy in C major op. 17; at the end of the first movement Schumann cites a no less significant passage verbatim: “Nimm sie hin denn, diese Lieder, die ich dir, Geliebte, sang” [Accept them, these songs, that I sang for you, oh beloved.]. At the end of this entry you will find a quite extensive Youtube playlist of Mondnacht recordings. But one recording is missing, namely Christian Gerhaher und Gerold Huber (compare my entry from 1. August). Instead, I can present the link to a fantastic private recording of Christian Gerhaher and Gerold Huber performing Beethoven’s “An die ferne Geliebte”. Right in the beginning and again at the end (“Nimm sie hin denn, diese Lieder”) you will hear the passages that Mondnacht picks up on. In my attempt to approach this special Schumann song I ensured the knowledge and art of one of the most renowned singers and song teachers of our time; I had the honour of speaking at length with Dr. h.c. mult. Edith Wiens on the topic of Schumann’s Mondnacht. Not only do Edith Wiens’ concerts and recordings convey Schumann’s voice with such incomparable inspiration and enchantment, but she is also soon to answer the calling for a teaching position at the Juilliard School of Music in New York. My conversation with this great artist lasted over an hour and for reasons of space I can only include excerpts here (mostly in German, some in English). First our conversation centred on Eichendorff’s text and its “transcription” into song. And that led to Schumann and why Mondnacht is such a special song. What, in Edith Wiens’ opinion makes a successful interpretation of Mondnacht? Hardly a singer (among professionals) is not at least a tiny bit in awe of Mondnacht. Why? What are the alleged (technical) difficulties? Does one need to have reached a certain age to sing Mondnacht? And where does this song stand in technical and vocal regards within the context of the other songs of the cycle? Which pitch of voice does Edith Wiens prefer for Mondnacht? Is it a song more for the male or female voice? Is it acceptable to transcribe the music? Afterwards Edith Wiens and I listened to numerous (older and more recent) recordings of Mondnacht by Schumann that can be found on YouTube (see the list below). I was curious to know which recordings she liked or disliked and why. She had a word of praise or a friendly comment for almost every one of the singers we listened to. For me it was a wonderful teaching session filled with highly professional criticism. One of her favourite recordings is Dietrich Fischer-Dieskau accompanied by Günther Weissenborn, especially because of the vocalist’s performance. She found Richard Tauber’s interpretation too liberal, sounding almost improvised; and still his voice contains that famous “teardrop” that Edith Wiens finds so moving. She finds Bryn Terfel outstanding, like a “hot bath”; an opera singer who truly comprehends the song, but perhaps has some problems with the more gentle notes? 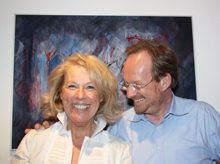 Among the more recent recordings she favours Matthias Goerne accompanied by Eric Schneider. Why? This is the link to the recording: [Video unfortunately no longer available]. Click here to hear the recording of Barbara Bonney with the wonderful accompaniment of Vladimir Ashkenazy: [Video no longer available]. The following YouTube playlist, specially researched for the readers of the Schumann-Forum 2010 (with the great support of Cornelia Nöckel – thank you!) contains dozens of Mondnacht recordings. You do need some time and have to be in the right mood to listen with concentration to song after song. Perhaps you would like to mark Tuesday, 24. August 2010 in your calendar for that purpose? It marks the night of the next full moon. (How do I know? www.timeanddate.com). Caution, though: You might become moonstruck! But of course, among us Schumann and Eichendorff enthusiasts this would not be regarded any way out of the ordinary.